Dustin Hoffman (r.) goes native in Little Big Man. 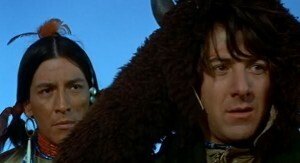 The well-respected 1970 revisionist Western film Little Big Man, directed by Arthur Penn (Bonnie and Clyde) and starring Dustin Hoffman (Straw Dogs) and Faye Dunaway (Network), makes its Blu-ray debut under the auspices of Native American Heritage Month. Stunningly restored so that Harry Stradling Jr.’s amazing cinematography is shown to best effect, the movie follows the life story of Jack Crabb (Hoffman), a white man raised by the Native American Cheyenne tribes. Crabb recounts his life, often comically, through flashbacks of the many historic events he witnessed — including the battle at Little Big Horn led by the egomaniacal General George Custer (Richard Mulligan, S.O.B.) — as the West was won as the bloody result of American imperialism and genocide of Native Americans. No are on the Blu-ray version of the PG-13-rated film save for a theatrical trailer.